"A quick sherbet with no fuss. Wild raspberries, seeds removed, are used for this yummy dessert." Heat raspberries and sugar in a small saucepan over low heat, stirring, until sugar dissolves, about 5 minutes. Press raspberry mixture through a strainer into a bowl; discard seeds. Stir milk, lemon juice, and cinnamon into raspberry mixture; refrigerate until cold, about 1 hour. Freeze milk mixture in an ice cream maker according to manufacturer's instructions. 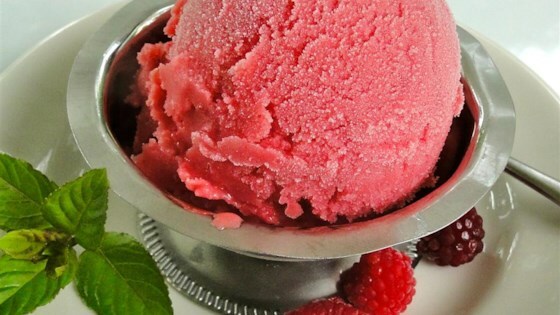 I'm the submitter of this recipe and I would like to state that for a more raspberry flavor, the cinnamon may be omitted and/or the raspberries increased. I didn't have wild raspberries.I used store bought raspberries. I took the suggestion from submitter. I added more berries and omitted the cinnamon. It was creamy and refreshing. Good, captures the tartness of the berries. It would be neat to find a use for the pulp left from straining.